I learned so much from this book, that when it was finished, the first thing I thought was, “I want to know more”. So I immediately went to the computer and started googling. What did I find? All kinds of information! Enough to make me wonder if I’m the only one who didn’t know the full story of the Hurons and the Iroquois. Shouldn’t we all know this? I was curious about Aataentsic, who the Wendat people call Sky Woman. I hope you are too, because I’m about to fill you in. One of the versions of the creation story I read tells that there were once two worlds – one in the sky, and one was Earth. The Earth was covered only with water. The people who lived in the sky world were like humans. One day Aataentsic fell through a hole in the sky. When Great Turtle saw her coming, he ordered some of the other animals to dive down and bring up soil from the bottom and place it on his back. This is how Earth was formed and Aataentsic landed on it. When Aataentsic fell to Earth she was pregnant and gave birth to a daughter, who in turn became the mother of twin boys: Tawiscaron and Iouskeha. It was Iouskeha who created the lakes and rivers, released the animals, created crops to eat and tools to hunt with. Tawiscaron spent his time trying to undo all the things Iouskeha had done. Iouskeha fought with his brother and Tawiscaron fled. After that, Iouskeha and his grandmother continued to live together in the sky. Iouskeha tried to make life better for the people on Earth, while Aataentsic was a spirit to be feared. They lived very much like the Wendats lived on Earth. This was the village of the dead, where souls goes after death. The Huron Nation believed all souls went to the same place after death. They did not think in terms of good or evil – all people and spirits had elements of both. In the beginning, there were no Crows (Europeans). There were just the different aboriginal communities. They didn’t always get along, but they understood each other. They believed that all natural objects – including humans, animals, plants, rocks – had a spiritual energy, known as orenda. The narrative in this story is told through three characters. Bird who is a prominent Wendat man, Snow Falls who is the girl he takes home to adopt as his own after killing her family, and Christophe who is the Jesuit missionary sent to bring Christ to the ‘savages’. Through their narratives you get a really good sense of who they are, how they think, and what they believe. The arrival of the Europeans caused a lot of friction between the Huron and the Iroquois. The Iroquois wanted them gone, but the Huron wanted to trade with them. The Europeans also brought with them illnesses that the Wendat had no immunity for. This caused them to lose many of their people. The Iroquois took advantage of their enemies’ weaknesses. While all this was going on, there was also a rift forming within the Huron Nation itself. There were Jesuits living among the Huron who had dedicated their lives to converting the Wendat people to Christianity. While most just tolerated their presence and thought of the Jesuits as a form of entertainment, others were being tempted to convert. This caused the village to become divided at a time when it was crucial they remain united. During a conversation in which Christophe is explaining how the Christian way is better, a Wendat woman tries to tell him otherwise. I find this part of the book so interesting. The amount of time and effort that is spent by the Jesuits to bring Christianity to the people fascinates me. After spending so much time with the Wendat, why could they not see that they were causing more harm than good? For so long, they had so little to show for their efforts, but they did not give up. It becomes obvious that they must truly believe they are doing the right and good thing. So, although their mission, and the fact that they think only Christianity is the right way, infuriates me, I find it hard to hate them. And, is this not a theme in this book? There are no good guys or bad guys. Everyone has elements of both. And there is not simply one person, or group of people, to blame for what happens. Yes, the crows continued to caw as crows are prone to do, and after a while we got used to their voices even when they berated us for how we chose to live. A huge part of the book is about the territorial wars between the Huron and the Iroquois. What set them off, it’s hard to say, but their battles seem so brutal and violent. Yet, reading the story and what the people are thinking and feeling as it applies to their lives on earth as well as in the spirit world, you get a different picture. Then, even the horrific torture doesn’t seem so awful. They ‘caress’ their prisoners so purposefully. If they can’t cause their prisoner to cry out for mercy they feel they will “certainly face misfortune in any future battles”. They must keep their prisoners alive until sunrise, because ” To allow them to die before the sun’s face witnesses it is especially poor behavior and will only invite bad luck upon our heads.”. As more of the Jesuits come to live nearby the Wendat village, their biggest foe becomes illness and disease. Bird and Fox contemplate what to do about their severely dwindled numbers and their low harvest of crops. Fox is tempted to kill all the Jesuits so that maybe life will go back to the way it was before. But Bird thinks it’s too late. Bird starts doubting all his past actions. What if we’d never come across your family on that winter day? What if I’d never killed your parents and taken you for my own? Would all this bad blood between your people and mine have turned so poisonous? All this is what makes this book so great. You can google the history of the Hurons and the Iroquois and leran what happened. But can you read all the thoughts that are going on inside their heads? Can you get a real feel for how they lived and loved? Can you truly understand how and why everyone acted the way they did? Joseph Boyden has brought the story to life. It is fascinating, beautiful and brutal all at the same time. When it was over, I wanted more. Every Canadian should read this book. We had the magic before the crows came. We’d never questioned this before their claws first grasped our branches and their beaks pecked our earth. But this isn’t about sadness, or pity, or blame. We’re all party to our own wants as well as to our own shortcomings. What’s happened in the past can’t stay in the past for the same reason the future is always just a breath away. Now is what’s most important, Aataentsic says. Orenda can’t be lost, just misplaced. The past and the future are present. I love, love, love this book. Super happy you seemed to enjoy it as much as I did (and got as much from it as I did). This is a tragically underserved period of Canadian (and North American) history. 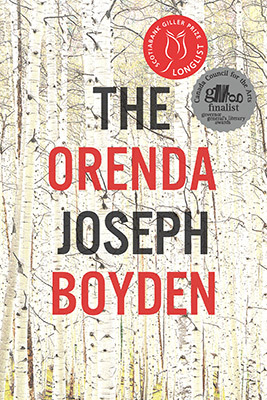 I was beyond upset that Boyden wasn’t the Giller winner this year (not even a finalist!). Ridiculous. I agree with you! This book made me hungry for more. What else is out there that would compare? As far as this subject matter goes, I have no idea. I’m definitely not versed in Aboriginal history. However, if you enjoyed this book, I want to recommend a book I’m reading right now. River of Stars by Guy Gavriel Kay. It’s an alternate history of China around the 12th century or so. SOOO good. I could definitely see Orenda fans loving it as well. They’re probably two of my top three or four books I read this year. That sounds good! Thanks for the recommendation! I’ll be watching for it. I’ve been wound up for reading this book since I first heard of it, but it’s not available here until May (unless I want to import it or get it on Kindle…and I’m a library loan gal right now.) But I will definitely be nabbing this one as soon as it’s more readily available. Thanks for commenting and for the compliment! I really wanted to do this one justice so others would want to read it. I hope when you get your hands on it, you enjoy it as much as I did! I really want to read this book in 2014 and I’m trying to convince my friend to read it with me. Is it your favourite for Canada Reads? I’m pretty sure it’s my favourite of the 5 Canada Reads books, but I haven’t made up my mind yet about the best book for the Canada Reads theme this year- the one book that could change the nation. I still have one book left to read for it. I’m so happy you’re sold! It’s such a good book with important things to say. Do you know how ecstatic I was when it won Canada Reads that year? ?